Lodge Facilities include: Swimming pool with new chillout deck, fully-equipped shared kitchen, wood fire in main lodge for winter nights, music, dvds, television, pool table, volleyball, petanque, table tennis, croquet and enough room to kick a footy! Barbeques, and herb gardens for the guests to use. Bike, surf and bodyboard hire and loads of other sporting equipment available. 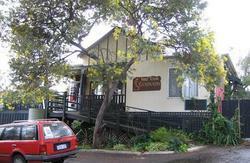 The Margaret River Backpackers and Lodge is associated with YHA Australia. Margaret River Lodge can also help working holiday makers find jobs in the local area. Directions: From Perth: Turn right at the end of the main street into Wallcliffe Road, which continues to the beach (Prevelly). At the round about turn left into Railway Terrace. You will find us on the right hand side. From Augusta: Turn left into Wallcliffe Road towards Prevelly before you enter the main street. Turn left at the round about into Railway Terrace. You will find us on the right hand side.